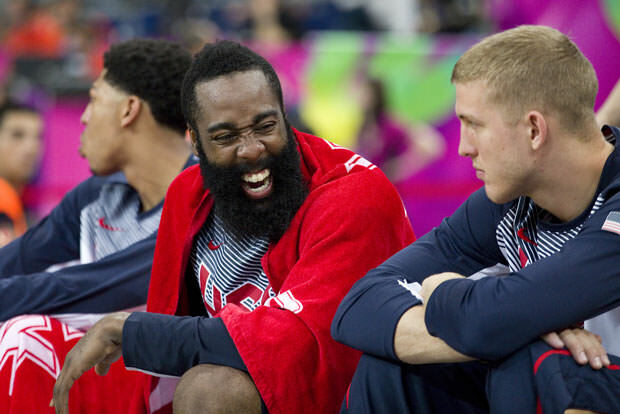 James Harden turned 26 yesterday and if photos from the celebration are anything to go by, he had a great time in the company of his new girlfriend Khloe Kardashian and the rest of the Kardashian-Jenner Conglomerate. The party began at midnight when Khloe set off a fireworks show which lasted for 15 minutes and ensured that everyone in the 50-mile radius is aware something was happening. TMZ reported that thousands of residents in the “affected area” were awakened by the insane display. Kim shared a few pics from the celebration too, one with The Beard almost invisible behind her, Kourtney, Khloe, Kendall and Kylie and another with Kanye and Kris snoozing and Harden giving them bunny ears.